This is the seventh article in our series called Buying a Home 101: Everything You Didn’t Know You Needed to Know Before You Buy Your First Home. This step-by-step series will take you through the entire home-buying process — from finding a buyer’s agent to settlement day, and even to maintaining your home after you’re all moved in. Make sure to tune in every week! You’ve done it … you found the home you want to buy! Now you’re ready to make an offer and tackle some of the next steps that will make you a homeowner. First, it’s time to determine your offer price and the amount of your earnest money deposit to show you’re a serious buyer. You’ll need liquid funds for this deposit, so make sure you’re ready to write a check with your offer. Step 1 – Evaluate the home and determine an offer price. • Work with your agent to agree upon a competitive price dependent on current market conditions. • Don’t just accept the asking price. Homes can be overpriced or underpriced initially so you need to validate the price. • Use comps or a list of comparable sales of homes similar to yours in the neighborhood or building. Calculate the difference between the asking prices and final sale prices to get a feel for market conditions. Also look at those final sales prices to get an average of the current market price for your type of home. • Closely compare your home to the others that recently sold to see if your home has any valued-added features that might make the price go up OR lacks something that would bring the price down. • Consider all variables — Has this home sat on the market a while or has it just been listed and may sell quickly? Is it more of a buyers’ market or sellers’ in this neighborhood? • Find out about competing bids since these will affect your own offer. If there will be multiple offers coming in, then going above the asking price is a given at this point. You and your agent can determine how much to go over. • Determine your walk-away price so you know your own price ceiling if the sellers continue to counterbid. Don’t get swayed to go over budget … you will regret this! Step 2 — Make an offer and be willing to negotiate. 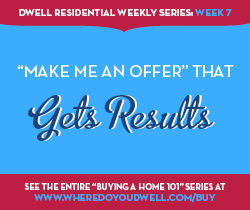 • If you make an offer under the asking price, make sure you back it up so the sellers don’t view it as just a “lowball” offer. Show them current comps or indicate any valid issues that may decrease the home’s value. • Keep your offer simple with little stipulations if possible. This makes it easier for the seller to accept your offer and can help seal the deal quickly. If you’re a first-time buyer, you won’t have to deal with another home to sell, so that’s a plus! • On the other hand, be flexible when taking into account any stipulations by the seller. If you can accommodate the seller, do so if possible. For example, they may want to rent back from you for a month until they can move out of the home. • Be cordial and not critical of the home. Sellers can be sentimental and may select buyers for more personal reasons than just price. It’s time to go for it! Write your own “love” letter about the home and why you and your family will be the right owners to care for it. Your agent can also pass along information about you. • Make your offer contingent upon the findings of a professional home inspection. You’ll want to be able to renegotiate or back out if major defects are found. • Offer to pay all or most of the closing costs if possible to increase your chances of being chosen. Step 3 — Show you are a serious buyer. • Always include your pre-approval letter for a mortgage and put up a reasonable amount for your earnest money depsit. You want to show the sellers you are serious and capable financially to buy this home. • Your earnest deposit should send a signal to the sellers that you want that home and are willing to put 1% to 5% down with your offer. If the home just came on the market and already has multiple offers, you may need to go higher in price and/or have fewer contingencies. A seller is going to choose the best offer first and start negotiating with that offer. So, give it your best shot right out of the gate in these circumstances. If the home has been on the market for a time, you’ll need to write a completely different offer — one that is more favorable to you versus the seller. Always back up such offers with comparables to support a lower price. With these tips in mind, you should be able to close the deal on our new home. Just a few more steps ahead and you’re almost there! Next week in our Buying a Home 101 series, you’ll learn what you need to do once you’re under contract to buy a home. Our eighth article, The Inside Scoop on Locking in Your Mortgage Rate and Home Appraisals, will cover these two very important steps that can affect your sale and the interest rate of your loan. Stay tuned!